The road from Smyrna to Dover has many schools within a few minutes drive; I stopped at every one that I could. Seven Guidance Counselors and Principals along that stretch of road, now know, first-hand of One Million Acts Of Kindness. I love this new addition to my travels. We arrived on the Wesley campus and immediately had a group of students approach, within moments, the skies opened up, raining down 4 inches of rain in a two hour period. 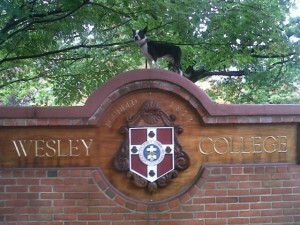 Bogart chose his perch above the deluge, but more importantly, a dog’s eye view of this squirrel friendly campus. The squirrels on this campus are almost trained to eat out of your hand. Bogart, I’m sure, if left to his own resources, would catch one of these tame squirrels. Even with the major rainfall, we managed to talk with over 50 students on this very friendly campus. This entry was posted on Wednesday, October 27th, 2010 at 11:42 am	and is filed under Kindness. You can follow any responses to this entry through the RSS 2.0 feed. You can leave a response, or trackback from your own site.